Equipment items can now have their durability upgraded up to 100 through item reinforcement! Item reinforcement services are offered by [Armor Merchant] Saki in Junon Polis. Item durability can increase on success or decrease on failure by up to 5 levels per reinforcement attempt. Items that fail a reinforcement attempt will not drop below 1 durability. Items with 0 durability are considered to be damaged beyond repair and cannot be reinforced. Several new materials which are used to reinforce items are dropped by monsters in Game Arena dungeons. Reinforcement Powder - Used to reinforce items at all levels of durability; Uncommon tier. Reinforcement Alloy (Sn) - Used to reinforce items up to 40 durability; Rare tier. Reinforcement Alloy (Cr) - Used to reinforce items up to 60 durability; Rare tier. Reinforcement Alloy (Mn) - Used to reinforce items up to 80 durability; Rare tier. Reinforcement Alloy (Ti) - Used to reinforce items up to 100 durability; Rare tier. Reinforcement Compound - Boosts success rate on a reinforcement attempt. Reinforcement Protector - Prevents item durability from degrading on a failed reinforcement attempt. Corrected an exploit which allowed paradigm runes to be traded under specific conditions. Corrected issues with Uncommon and Very Rare tier item drops for monsters in Game Arena dungeons. So happy to see that you guys fixed rune trading, sad to see players found another way to exploit it. Keep up the solid work bud, I know you're probably a busy guy. What is uncommon and rare tier means? the drop table or the gears tier that can be reinforced? Does unique/epic, exalted, grade 9 also can be reinforced? I'm assuming it's all equipment items, and the uncommon and rare tier means the drop table that it will be in. So I'm not necessarily against a new system being implemented, but I'm slightly displeased with the balance behind it. Basically, it favors Raiders more than anyone else; the undisputed most played class by a mile and also a contender for the 'strongest' class as well. Why does this favor them? Soldier armor has higher base durability but the lowest dodge, so increasing the durability on their armor won't make much of a difference. Basically assuming you max out the durability on weapons and armor, everyone gets higher dodge, though hawkers (specifically raiders) get the biggest upgrade from it. Durability increases Accuracy, Dodge, and the lifespan of an item. Some equipment start off at a very low durability, which means it has a higher potential stat gain as of now. While on the contrary, other equipment with high durability get capped out very early on and get less of an upgrade. However, I do feel that any class that can utilize dodge (ie raiders) just got a buff because the weapon is only 1 slot in comparison to armor being 5 slots. Some classes don't use dodge, so everything just got skewed towards supporting dodge based classes or any class with low base dura equipment. Is this ok? This Item Reinforcement System is a good idea, it tweaks the classes a bit except I hope it was made to balance the game and not done just for whatever other reason. Edited by henrycao, 16 April 2018 - 08:05 PM. Yey, Update! I agree that it might actually benefit raider the most, but will also benefit other classes as well, at least for me it's good because I solely do PvM. But I hope class imbalance should be fixed too should it become too apparent. Thank you again for an amazing update! Edited by Vertumnus, 16 April 2018 - 10:01 PM. I was already afraid this durability update would allow players to reach the 100 durability on an item. This will likely have serious balance consequences, some classes more so then others. Edited by Cortiz, 17 April 2018 - 05:45 AM. Drop rate on alloys is super high. Probably should be lowered slightly, as you can't even pick everything up most of the time in cave of ulverick and you don't get enough reinforcement powder in comparison to it. You need powders for all reinforcement levels and more per refine attempt than alloys yet alloys drop probably 5x the rate that powder does. There simply are too many materials dropping to even have the inventory space to hold onto anymore. In the last 2 months, 14 new material items were added to dungeons. 7 different small orbs, 4 alloys, then reinforcement powder, prismatic lattice, and prismatic fiber. (the lattice and fiber are dungeon rewards yes, I know) This also does not include the 7 different large orbs that drop from open world enemies (albeit a horrifically low rate) as well as prismatic dust. 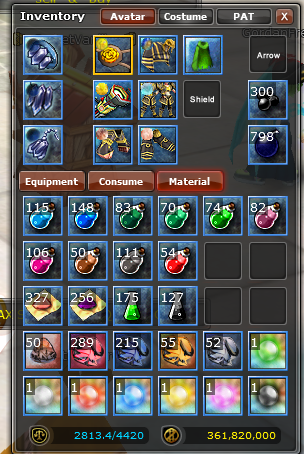 As you can see, this does not include Pardigmatic ores, Paridigmatic Dust, Prismatic Fiber, Prismatic Dust, Empowerment Shards, which are relatively common dungeon rewards, all of which are important materials to hold on to. Not to mention 9th grade bindrunes and apotropes, ancient scarabs, forest ash, all of the droprate gems, ulverick medallion etc, and runes as well. There simply isn't enough inventory space for everything; I don't even have room to hold ammo anymore because of all the drops, and I can't really just scrap some of the less important ones because so many items drop at a time in cave of ulverick that you have to spam the pick up action rather than select specific items. Drop rate on Alloys should be lowered somewhat. Drop rate possibly could be increased on reinforcement powder (possibly). Prismatic Lattice, Prismatic Dust, Prismatic Fiber, Large orbs should all be purple in name, not yellow. Lastly we really need to see some class balancing soon because this update makes the already most played/overpowered class (in pvp) stronger. Edited by Phish, 17 April 2018 - 08:04 PM. please fix this if this is bug. Courage Jackal Bandit Boots cant be reinforced ? *It was Dura 1 fyi. Edited by dadardz, 21 April 2018 - 03:28 AM. I got Durability 1/1 from GM/support, since i requested them to change my 2 head parts which bought mistakenly, so they change the 1 head part to boots as i requested. But the problems is, they gave me dura 1/1 which can't be reinforce. So in this case im confused if dura 1 which not possible to reinforce is a bug? or designed at it is? If it is design as it is, means any dura will go down to 1 Dura will not be reinforce anymore (looks like impossible but maybe some cases). Sounds like a bug, cause in the patch notes gen say u cant refine 0 durability items but 1 durablity is possible? But in all honesty, it looks like there's something wrong with these 1 dura items cause I can't refine any IM mask with 1 dura. At first I thought you couldnt reinforce masks in general but i was able to reinforce a deku mask with 22 dura or a gloopy mask so I suppose its related to that. Edited by Cortiz, 22 April 2018 - 01:45 PM. THIS ! IS ! IMPORTANT ! We have so many materials now... and some of us even need ammo... we don't have enough space in inventory anymore. And the droprate of other needed items is lower now... like Ore... or Lisent... or Shards.... because the new materials are added and they are all in the same dungeon droptable. Another possibility is to just limit the amount of chemicals that drop in dungeons. There are 10 different chemical types, not all 10 of them need to drop from every dungeon. In fact, 10 different ones with a .1% difference in success don't even need to exist. They could just be condensed down much like the powders and lisents were. There was a period in time where there was actually 15-20 differen powder and lisent types, and they were condensed down to the 4 we have now for logical reasons. For example., chemicals could be condensed down to 5 much: essence, ether, elixir, enthiric, hermes. Just a suggestion though, as those have all been here since the beginning of time.